In World War II, Britain’s prime minister dreamed of making peace with Hitler. Today, the U.S. has the same fantasy. We live in the most dangerous times ever. And they are getting much more dangerous every day. At the same time, most people are afraid to face reality—even though that frightening reality is a sign of the best news we could ever imagine. Two bombshell events happened within one week—the Annapolis “peace” talks and the release of a National Intelligence Estimate (nie) regarding Iran’s nuclear weapons program—that signal a nation-destroying change in American foreign policy! Both events reveal how Americans prefer to live in a fantasy world—like the one portrayed in the nie. Like little children, far too many Americans hide from the ugly and dangerous truth. It is hard for me to read about the Israeli-Palestinian “peace” conference in Annapolis—which the U.S. hosted on Nov. 27, 2007—and not think about the relationship between Adolf Hitler and Neville Chamberlain before World War ii. Many experts believe we came dangerously close to losing that war because we refused to face reality. Winston Churchill called it “the unnecessary war” because we failed to confront Hitler’s humiliation of the West before he became so powerful. Hitler and the Nazis demanded “the removal of German Jews from all walks of German life.” Hitler’s sick and dangerous demands should have been met with a resolute will. But Chamberlain and others had a defeatist attitude. As a result, Hitler and Germany eventually caused the deaths of 50 million people. 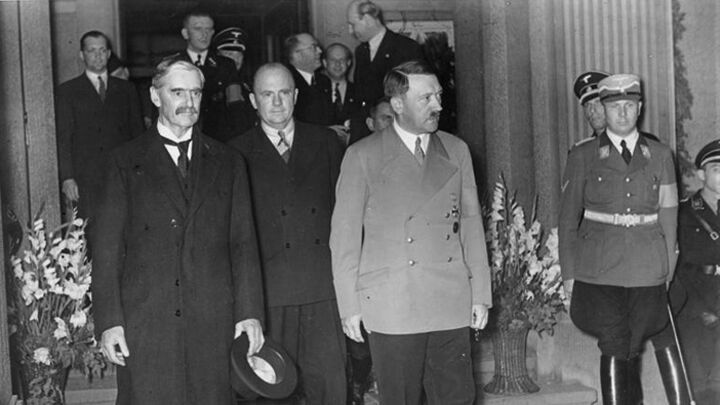 During the 1930s, British and other Western diplomats worked feverishly to have peace with a diabolical Hitler. Neville Chamberlain, the last prime minister before Churchill, was humiliated and had his career tarnished forever by the Nazis. The media, politicians and people of Britain and America were supportive of Chamberlain’s allowing himself to be bullied and abused by Hitler before the whole world. (Just as most of our media, politicians and people loved the Annapolis conference.) There was a strong buzz about Chamberlain receiving the Nobel Prize—until Hitler started World War ii. Winston Churchill warned Chamberlain and others throughout the 1930s against giving in to Hitler’s egregious demands. But he wasALONEand almost driven from his own party—until people were forced to see that he was right. However, they didn’t see it until it was almost too late. Let’s just imagine there had been some kind of “peace” made with Hitler. What kind of peace can you have with a murderous racist who wants to remove a whole race of people from his society? The West did nothing as Hitler toppled the government of Austria and got control of that country. Many Jews and others were slaughtered. The Times of London even tried to justify Hitler’s enslaving of that nation against the majority’s will. That was a land-for-peace deal—which is exactly what Israel has been using for many years to try to gain peace with the radical Arabs. What does this tactic say about Israel? It is in its final phase as a nation if it doesn’t wake up! After devouring Austria, Hitler wanted the Sudetenland of Czechoslovakia. Britain and France forced that country to give away a large portion of its territory—all in the name of peace. Then Hitler attacked and conquered all of Czechoslovakia. The West let it happen to a freedom-loving country, in the name of peace. Britain and France didn’t declare war until Hitler attacked Poland. But even then, Chamberlain tried to get Hitler to withdraw from Poland and sign a peace treaty with Britain. What a fantasy world Neville Chamberlain lived in. I marvel that we have learned no lessons from what happened in the 1930s. In spirit, Churchill is alone once again. His views run totally counter to the Nazi spirit that prevailed at the Annapolis “peace” conference. That means a far worse danger is just around the corner, as it was in the 1930s. On Nov. 30, 2007, Caroline Glick wrote in her column for the Jerusalem Post: “This week the Bush administration legitimized Arab anti-Semitism. In an effort to please the Saudis and their Arab brothers, the Bush administration agreed to physically separate the Jews from the Arabs at the Annapolis conference in a manner that aligns with the apartheid policies of the Arab world which prohibit Israelis from setting foot on Arab soil. “It is true that Israel has security concerns, but as far as [U.S. Secretary of State Condoleezza] Rice is concerned, the Palestinians are the innocent victims. They are the ones who are discriminated against and humiliated, not [Israeli Foreign Minister Tzipi] Livni, who was forced—by Rice—to enter the conference through the service entrance” (emphasis mine throughout). The foreign minister received that repugnant treatment even though she came prepared to make weighty concessions. How abominable! The spirit of Hitler prevails again. And somehow we think this is going to bring peace. This is not the way to peace—it’s the way to war! Just as it was in the 1930s. We are nurturing the Nazi spirit to our everlasting shame! This is about two nations—America and Israel—that lack the will to survive! It’s about the end of two world powers! It has horrifying consequences for the West. Caroline Glick wrote, “Israel’s humiliated foreign minister did not receive support from her American counterpart. Secretary of State Condoleezza Rice, who spent her childhood years in the segregated American South, sided with the Arabs. Although polite enough to note that she doesn’t support the slaughter of Israelis, she made no bones about the fact that her true sympathies lie with the racist Arabs. “Rice’s remarks make clear that for the secretary of state there is no difference between Israelis trying to defend themselves from a jihadist Palestinian society which supports the destruction of the Jewish state and bigoted white Southerners who oppressed African Americans because of the color of their skin” (ibid.). What a fantasy the U.S. is now promoting. Israel has continually given back land to the Arabs, which it won in a war that the Arabs started. These territorial concessions threaten Israel’s own security as the Nazi Arabs gain control—as they have in Gaza and a large portion of Lebanon. Still, America is moving toward their side, away from Israel. This is not about Israeli bigotry and racism. It’s about America’s broken will. It is easy to see why the Israeli-American alliance is beginning to crumble. What a paradox. Israel is the only true democracy in the Middle East. Have we already lost the war against terrorism? America is helping to extinguish what it professes to be fighting for in Iraq: freedom and democracy. The end of all this is going to be worse than we can even imagine. Syria, the second-leading terrorist-sponsoring nation in the world, came to the conference only because America agreed to allow its chosen leader to gain control of Lebanon. The terrorists already have the upper hand there. The political party of Saad al-Hariri, son of assassinated former Prime Minister Rafik Hariri, has tried to limit Syria’s influence in Lebanon. On Nov. 28, 2007, however, his party agreed to a constitutional amendment that opened the door for Michel Suleiman, commander of the Lebanese Armed Forces, to be elected president. The Weekly Standard reported, “Up until now, Hariri and his March 14 allies (the date of the 2005 Cedar Revolution) had resisted Suleiman’s candidacy; Lebanese democrats are generally loath to have military men serve as president of the republic, especially after the last nine years of former commander Emile Lahoud’s presidency. But more importantly, Suleiman is Damascus’s number-one choice to fill the now-vacant spot. “So why have Hariri and his colleagues, including Druze chieftain Walid Jumblatt and leader of the Christian Lebanese Forces Samir Geagea, made an about-face? It is because of Annapolis. They feared Washington was going to cut a deal with Syria over Lebanon, so they made their own bargain to protect themselves since it is now obvious Washington will not. Thus, the wages of peace processing” (Nov. 30, 2007). Now we have a stronger killing machine in Lebanon, supposedly to bring peace! And who is rejoicing? The terrorists of Lebanon and the Middle East—instead of the more innocent, freedom-loving people who trusted in America to help them gain peace and freedom. The Arab Nazis will usher in a new era of “peace” in the Middle East with their killing machine—with a lot of help from the U.S.
We are helping this terrorist-sponsoring nation destroy a fledgling democracy. How could anyone not believe we are hurting our war against terrorism? Or have we just surrendered in that war? This is not the action of a real superpower. America made a watershed change in its foreign policy at Annapolis. History clearly shows us that this will lead to a colossal disaster! How despicably weak and childish our foreign policy has become. Remember this: The aftereffects of Annapolis will be even more bitter for America than for Israel. Winston Churchill has already shown us that. But nobody learned from his example. So prepare yourselves for much more suffering to come. There are consequences for such heinous deeds! Not one week after the Annapolis conference, the U.S. intelligence community released the nie about Iran. This report was America’s indirect announcement to a stunned world that we lack the will to ever stop Iran from getting nuclear weapons. Iran is the number-one terrorist-sponsoring nation in the world—by far. The Israeli intelligence network is probably the best in this world. Israel estimates that Iran will have nuclear bombs within two years—a radically different view than the nie report. When Iran gets nuclear weapons, it is more likely to start a nuclear World War iii than any nation on Earth. President Ahmadinejad already said he would wipe Israel off the map. That is not the kind of mind that diplomacy is going to change. The terrorists of Hezbollah and Hamas control southern Lebanon and the Gaza Strip. They are sponsored and controlled by Iran. They frequently attack Israel without being provoked. How much more dangerous will this world be if they get nuclear weapons? Well-meaning but weak-willed, dangerous peaceniks (what Churchill called them) in politics and the media helped and encouraged Hitler to start World War ii. He could have easily been stopped in the early years. Weak leaders said diplomacy would work. But diplomacy only paved the way for Hitler’s causing the death of 50 million people. Churchill stood alone, warning of the coming catastrophe. Many people called him a warmonger—until they came to see he was right. We are repeating the same distressing, inexcusable error today. When the peaceniks get control, surrender and war are almost certain to follow rapidly! That is especially true in peace-loving nations like America, Britain and Israel today. Peaceniks offer virtually no resistance to tyrants and even encourage them in their warring spirit. Maybe we should start calling these people who seek peace at any price warmongers! History would certainly justify such a label. Here is what Churchill said after his long warning in the 1930s and shortly before World War ii began: “When the situation was manageable it was neglected, and now that it is thoroughly out of hand we apply too late the remedies which then might have effected a cure. “There is nothing new in the story. It is as old as the Sibylline books. It falls into that long, dismal catalogue of the fruitlessness of experience and the confirmed unteachability of mankind. Want of foresight, unwillingness to act when action would be simple and effective, lack of clear thinking, confusion of counsel until the emergency comes, until self-preservation strikes its jarring gong—these are the features which constitute the endless repetition of history” (Gilbert, op. cit.). Churchill was a high-level government official before and during World War i. The government he served made terrible mistakes shortly before and during that war. Mr. Churchill was horrified to see the same mistakes being repeated in the 1930s and during World War ii. The Western world scoffed at his warning of a coming world explosion. Several reputable historians state that Germany came dangerously close to winning World War ii. We are making the same tragic mistakes today that were made in those two world wars. Yossi Klein Halevi wrote this for the New Republic, December 6, after the nie was released: “America, even under George Bush, is hardly likely to go to war to stop a program many Americans now believe doesn’t exist. “Until now, pessimists here could console themselves that a last-resort Israeli attack on Iranian nuclear facilities would likely draw wide international sympathy and even gratitude—very different from the near-total condemnation that greeted Israel’s attack on Saddam’s reactor in 1981. Now, though, the nie will ensure that if Israel does attack, it will be widely branded a warmonger, and faulted for the inevitable fallout of rising oil prices and increased terror. “The sense of betrayal within the Israeli security system is deep. After all, Israel’s great achievement in its struggle against Iran was in convincing the international community that the nuclear threat was real; now that victory has been undone—not by Russia or the European Union, but by Israel’s closest ally. Anybody who doesn’t think Iran has a crash program to build nuclear weapons is simply refusing to face the truth. Weak-willed people make deadly mistakes from which a nation may not recover—especially in this nuclear age. It’s the same old story. History keeps repeating itself. That intelligence report did betray Israel. But it also betrayed the American people! It has caused them to relax and believe there is no immediate threat. It’s the Hitler scenario all over again, this time with Mahmoud Ahmadinejad. We should have learned from Hitler that our “peace” making is fostering a nuclear World War iii. If we think we can do nothing and somehow escape the raging danger, we are thinking like children! When a nuclear war starts, the whole world is going to be dragged into the fiery furnace. It isn’t that we can’t see the danger. We refuse to face it, hoping it will somehow go away. Instead, we make the problem a thousand times worse. Churchill experienced World Wars i and ii. He served as a watchman in both world wars—especially World War ii. But we have learned nothing from his vast experience and warnings. That means we are going to suffer as no people ever have by refusing to learn the truth. Here is another powerful statement from the New Republic: “Nor do senior analysts [in Israel] take seriously the nie’s vague assessments of when Iran will reach the point of no return: beginning in 2010, it says, though not likely until 2013 or even 2015. Israel’s point of no return is when Iran attains the potential to produce sufficient fissile material for making a bomb. And they believe that is likely to happen—barring continued mishaps, accidental or not, in the Iranian nuclear program, like exploding centrifuges—somewhere within the next two years. We should be thinking in terms of months, not years! However, major media outlets are picturing this as another intelligence blunder by the Bush administration. They are helping their political party win elections. They are also causing far-reaching damage to America. Politics are being placed above the welfare of our nation. That portends a black, foreboding future for America. These are the most dangerous times in our history. We can’t afford such terrifying blunders if we are to survive as a nation. Churchill kept crying out as a voice in the wilderness of political confusion. There was still a possibility, Churchill believed, of preserving peace. “Never must we despair,” he said, “never must we give in, but we must face facts and draw true conclusions from them.” It was now essential for Britain to retrieve “the woeful miscalculations of which we are at present the dupes, and of which, unless we take warning in time, we may some day be the victims” (Gilbert, op. cit.). We are not facing the facts. Our people are being duped by leaders who want to hear “smooth things” in a world filled with unparalleled dangers. Churchill continued: “Terrible preparations are being made on all sides for war,” and he added: “I do not feel that people realize at all how near and how grave are the dangers of a world explosion. Some regard the scene with perfect equanimity; many gape stolidly upon it, some are angry to be disturbed by such thoughts in their daily routine and pleasures” (ibid.). Prime Minister Stanley Baldwin later admittedhe put his own political interest ahead of the nation’s welfare! And his country came perilously close to death. The people wouldn’t face Churchill’s warning until it was almost too late. He talked about the possible “end” of Britain’s glories. But the people did not want to think about the bloody dangers of a world explosion. They didn’t want to be disturbed from their comfortable routine and pleasures. So they voted for politicians who spoke to them about more pleasures and a prosperous world. The same is true today. We face a far more spectacular world explosion. But we are too glutted on sports and entertainment to heed a strong warning. As Churchill said, history continues to repeat itself! We have not learned from the historical lessons of World War ii. Today, we are again surrendering to evil tyrants. Ehud Olmert has said that Israel is “tired of fighting.” America has the same sickness. It is a fatal disease to have in a world in which you have so many powerful enemies. Again, let’s hearken back to World War ii. France surrendered to Germany in six weeks. There were many reasons why France should have continued to fight. But its government was led by men with no will to fight. Charles de Gaulle was the only real leader in the higher echelon of government. But other leaders fought to keep him out of power. Would there even be a France today if it weren’t for Churchill’s fighting spirit? There are over a hundred prophecies in your Bible that tell us we are getting extremely close to the best news you can ever imagine! You can prove every one of those scriptures. You can also live to see every one of them fulfilled. Is there any hope? Yes there is! There is hope in ascertaining why America, Britain and Israel have a broken will. It was prophesied in the book of Daniel and other places (Daniel 9:10-14; Leviticus 26:19). Daniel didn’t even understand what he wrote. The biblical book of Daniel is an end-time book—it was written for us today. Request a free copy of our booklet Daniel—Unsealed at Last! The Prophet Daniel tells us that we can shine like the stars forever and ever if we face the truth. In the meantime, all we have to do is sit back and wait for Iran to test its first nuclear bomb. I feel strongly that we won’t have long to wait. Then all of the childish fantasies will quickly disappear. Isaiah prophesied that the ambassadors of peace shall weep bitterly! (Isaiah 33:7). That is a prophecy for this end time. What a brutal condemnation of our diplomats. We must learn why the ambassadors of peace are going to weep bitterly. Therein lies the real path to peace.